This classic preparation is simply the best clam recipe ever. Whenever bacon and butter appear in the same recipe, you know you're in for a treat! Not only are clams casino an easy recipe to prepare, they can be made ahead of time and popped under the broiler whenever you're ready. Scrub the clams under cold running water until the shells are clean. Add the bacon and cook until not quite crisp. Using a slotted spoon, transfer the bacon to a plate lined with paper towels to drain and set aside. Add the red bell pepper to the bacon drippings in the skillet, and cook, stirring often, for 2 minutes. Turn off the heat and stir in the breadcrumbs, Parmesan, black pepper, and salt. Reserve the mixture until needed. Add about 2 inches of water to a Dutch oven, or other heavy pot with a tight-fitting lid, and bring to a rapid boil over high heat. Add clams, cover, and cook for about 5 minutes, or just until the shells open. It's critical to remove and drain the clams as soon as they open. Twist and pull the clam shells apart, and remove the clam. Place the clam back into the deeper of the two shell halves. Divide the breadcrumb mixture evenly over the top of each clamshell, and top each with one piece of the bacon. Broil the clams, about 6 to 8 inches from the heat source, until the tops are browned and the edges of the bacon are crisp. Sprinkle the fresh parsley over the top, and serve hot with lemon wedges. 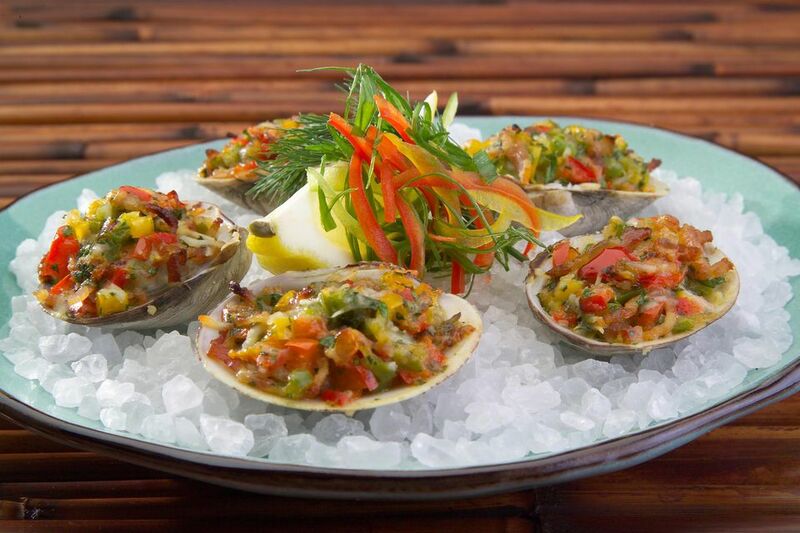 • Littlenecks clams are hard-shelled clams that are part of the quahog species. They are the smallest of clams, amounting to 7 to 10 per pound.